Passionate about cooking since his childhood days, Maxime Collard was 14 when he enrolled at Libramont Catering College. As a young graduate, his professional career got under way at the starred 'Les Forges du Pont d’Oye' restaurant in Habay-la-Neuve, where he worked for two years. Eager to learn and experiment, he left his native Ardennes to go and work in Flanders, where he would spend the next five years - two of which as a sous-chef - at the highly reputed De Karmeliet restaurant in Bruges (***). "Maxime Collard is a man of considerable drive, endowed with a tireless work ethic and a deep sense of creativity. " In 2009, aged just 25, he opened his first restaurant called 'La Table de Maxime' in Our in the Ardennes, where it took the chef just a year running his own business to convince customers and specialists alike of his culinary talents. 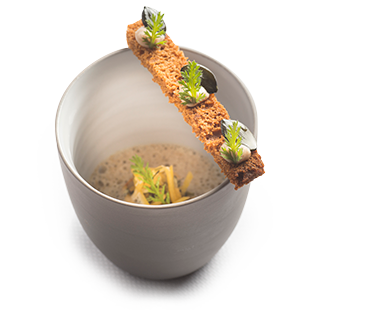 In 2010, 'La Table de Maxime' was awarded a star in the Michelin Guide and the young chef's reputation has not stopped waxing since. Constantly developing his thriving business and hot on the heels of 'La Table', Maxime Collard has since opened other establishments, all of which are situated closely to the 'La Table', all imbued by his passion for local cuisine sprinkled with a contemporary sauce.